India's largest online travel agency MakeMyTrip Ltd has reported 54.5% rise in net revenues (62.6% in constant currency) for the first quarter over the year-ago period powered by sharp jump in hotels & packages bookings. The NASDAQ-listed firm's net revenues rose to $58.86 million fuelled by 80.8% (89.8% in constant currency) rise in net revenues from the hotels business. Hotels & packages unit generated over half of the net revenues. "Our first quarter for fiscal 2017 achieved a terrific 478% year-on-year transaction growth in our standalone online hotels business, representing over 91% of all hotels and packages transactions in the quarter. This robust growth has also helped us achieve record quarterly bookings and revenue less service costs for our company," said Deep Kalra, group chairman and group CEO. MakeMyTrip, which is lodged in a pitched battle with Naspers-controlled Goibibo in the OTA business and especially in the hotels booking business, said it recorded almost four-fold jump in number of hotel booking transactions. The number of hotels and packages bookings rose from 430,100 in Q1 of FY16 to 1.5 million in the quarter ended June 30, 2016. In the same period, the number of air ticketing transactions rose 34% to 2.15 million. The firm's India hotels booking business increased by 478.2% YoY in Q1 and related bookings on the mobile increased by 870.8% YoY. The company that also runs hotels booking platforms in other markets, derives over 91% of hotels business from India. 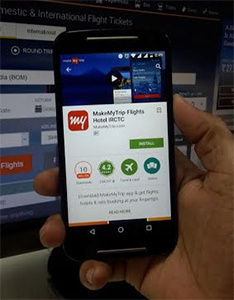 MakeMyTrip also improved its net margins for both the key units- air ticketing (5.5% to 6.5%) and hotels & packages (13.3% to 16.9%), it said on Wednesday. The firm raised its revenue growth guidance and projected net revenue growth in fiscal year 2017 in constant currency to a range of 35% to 40% as against the previously rolled out growth guidance range of 25-30%. "We remain optimistic of the long term business growth opportunities that are presented by India's low penetration in the online hotels market as well as the growing domestic aviation market. Based on the strong first fiscal quarter's high revenue less service costs achievement and the continuation of our high growth strategy to increase our India standalone online hotels market share, we are improving our outlook for year on year," it said. Gross booking value reached $565.9 million in the first quarter, representing a YoY increase of 27.4%. Gross bookings for hotels and packages increased by 48.7% last quarter. Meanwhile, the company slipped deeper into the red. Operating loss shot up to $27.8 million in the quarter ended June 30, 2016 as compared to a loss of $6.1 million in the year-ago period. Excluding the effects of employee share-based compensation costs, amortisation of acquisition related intangibles for both quarters ended June 30, 2016 and 2015, and M&A related expenses for the quarter ended June 30, 2015, it would have recorded an operating loss of $24.3 million last quarter as compared with an operating loss of $1.6 million in the quarter ended June 30, 2015. The firm's net loss too rocketed to $14.3 million as compared to a loss of $6.9 million in the quarter ended June 30, 2015. Adjusted net loss is pegged at $30.4 million in the quarter ended June 30, 2016 as against net loss of $2.2 million in the quarter ended June 30, 2015. Besides Goibibo, MakeMytrip competes with the likes of Yatra, Cleartrip, Via, Musafir and other online travel agencies in India. Early this month, Yatra.com said it is looking to go for a reverse merger with a NASDAQ listed blank cheque firm that would allow it to go public in the US.